What is the HP-JIO Fi Offer ? The HP Laptop and Desktop users will be eligible for the Jio Preview Offer through JioFi device. 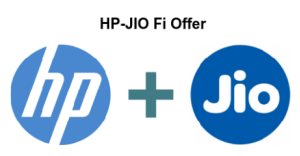 The HP users can avail this by purchasing the JioFi device and then activating the Jio Preview offer offer on it. The Jio Preview Offer will be the same as it was for the LYF and Samsung phones. It will include 3 months of unlimited 4g and also 3 months of free access to Jio premium apps through any mobile phone connected to the JioFi. How to avail the HP-JIO Fi offer? 1. The HP users will receive a message and an email from HP about the offer. The email or message will contain a unique referral code. 2. Customers will visit the Reliance DX Mini or Reliance Digital stores with the unique referral code to avail the offer. 3. The referral code will be scanned and if the validation is successful, then the JioFi device will be invoiced to them at a retail price of Rs 2,899. In case the validation is not successful, the user will not be given a JioFi device. The offer is valid exclusively for HP users. The offer is valid for only those HP users that have received the message with the HP-Jio Fi offer. Jio Preview Offer is valid only for 90 days after activation. Customer will need to fill a KYC form and submit an address proof and an identity proof before getting their JioFi device.The customer can apply for either prepaid or postpaid services. The referral code will be used to activate the sim and the JioFi plan. Customer will get a call on their registered number for tele-verification within 7 days of getting the device. As soon as the tele-verification is complete, the device and the offer will get activated. VoLTE calls and app to app sharing possible. Can host upto 31 devices simultaneously. Has 6 hours of battery backup and is fully charged within 3 hours. Comes in 3 colours; Red, Blue and Black. Priced at Rs 2,899 only. which site i use for getting hp jio preview offer. plz tell me proper site where i can register the product and get a mail with unique id for jio preview offer. i can register the product and get a mail with unique id for jio preview offer.